A massive fire at a recycling plant in the West Midlands is thought to have been started by Chinese lanterns. As well as fire risk they’re associated with other problems. Fire chiefs called for an “urgent review” into the use of Chinese lanterns after more than 200 firefighters were called to the fire in the town of Smethwick. The lanterns have become an increasingly popular sight at weddings, Halloween celebrations, music festivals and even funerals, with an estimated 200,000 being sold in the UK every year. The paper lanterns consist of a candle or a fuel cell filled with paraffin wax suspended inside a frame of wire or bamboo. When lit, they float gently upwards and drift away, landing when the fuel has run out. They can reach up to 1,000 metres in height and drift for several miles in the breeze. There are already bans or restrictions on the lanterns in a number of countries because of the hazards they can cause. 1. The danger to the environment and fire risk led Glastonbury festival organisers to ban Chinese lanterns. In 2011, festival organiser Michael Eavis called for a nationwide ban. Farmers’ groups and animal charities have long pushed for the lanterns to be withdrawn from sale, arguing that animals can eat parts after they have landed. In 2010, a cow died from eating a piece of a lantern’s wire frame, which ruptured its stomach, and a foal had to be put down after it injured itself on a fence because it was startled by two lights that landed in its field. 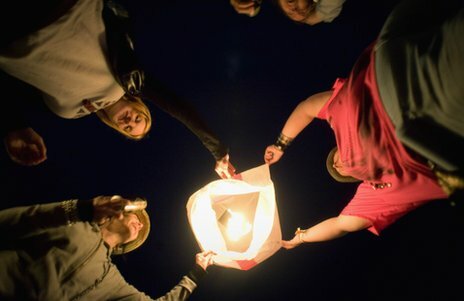 A number of firms in the UK offer what they describe as eco-friendly lanterns, where the frame is made from bamboo rather than wire, but the RSPCA argues these are still potentially harmful. The Department for Environment, Food and Rural Affairs (Defra) has turned down calls for a ban after concluding that the risk of death and injury they posed to livestock was “low”. 2. False alarms at sea for both the Coastguard and RNLI, after lanterns were mistaken for flares, led to more calls for a ban. In 2010, the RNLI said it saw a significant increase in the number of lifeboat call-outs caused by lanterns. The Marine Conservation Society last year added its voice to the campaign after a survey of beaches found an increase in rubber, paper and pieces of metal. The charity wants the lanterns to be classed as litter so people releasing them could be fined as much as £2,500, arguing that they are a danger to marine life, among other things. 3. According to civil aviation authorities, there is a danger of lanterns being sucked into engines while airborne. On the ground, lantern debris has the potential to cause damage to aircraft engines, tyres and fuselage, they argue. 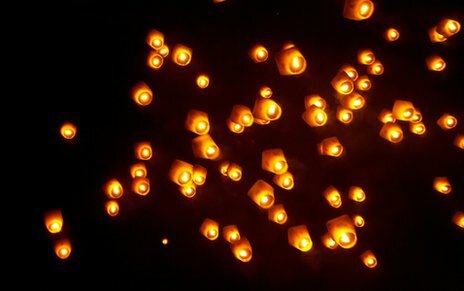 The lanterns have been banned in the popular tourist destination of Sanya, China, after dozens of flights had to be delayed. 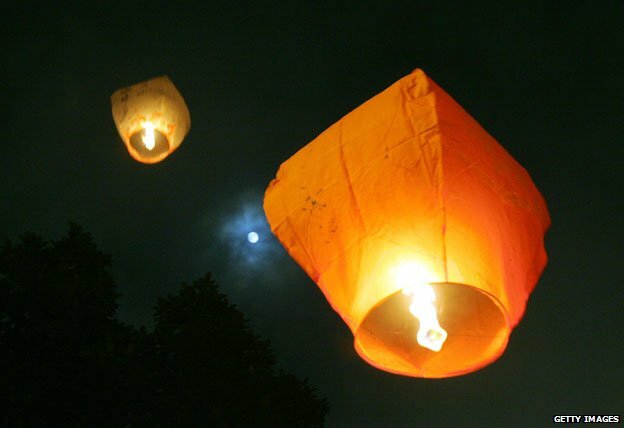 Last year, the Civil Aviation Authority in Donegal warned against the use of the lanterns after one landed near a container packed with thousands of gallons of aviation fuel. 4. They pose a fire risk. In a nationwide survey in 2011, a third of Britain’s fire brigades said they had received emergency call-outs to extinguish lanterns. Damage caused included scorched gardens and roofs. But firefighters said they had experienced a number false alarms as the lanterns had burnt themselves out before they arrived. The lanterns are at their most dangerous in the summer because of drier conditions. They have been banned from a number of local authority firework displays. 5. UFO sightings dramatically increased as lanterns became more popular. Recently released National Archive files show that the Ministry of Defence’s now-defunct UFO desk logged three times as many reports in 2009 – the year it was shut down – than in an average year. At the time, Nick Pope, head of the MoD’s UFO Project, supported the theory that many of those sightings were down to Chinese lanterns. “I’m not disparaging the whole UFO phenomenon,” he said at the time. “But I’d say 99% of UFO reports involving orange lights in the sky these days are attributable to these lanterns.” One of the earliest UK newspaper headlines revealing the confusion between lanterns and UFOs was in 2006. Residents of a small Scottish town who spotted strange lights in the sky called the police, but the “saucers” turned out to be Chinese lanterns released during a wedding ceremony. The Daily Star reported the incident with the headline: “DID THE EARTH MOVE 4 UFO? ALIENS WEDDING PANIC.